NOTE: Jeph Duarte is out from August 9-14. I’m covering the Open Thread with a 5 part story about NBA Las Vegas Summer League. This is the final installment. Previous parts are here: part 1, part 2, part 3, part 4. We’ve finally reached Monday, my last full day in Vegas. I’m going to miss the final day of pool play on Tuesday, which includes the Spurs final game against the Blazers. The Spurs had already shut down their two best players due to injury (White/Walker—The Game of Thrones lineup) and the Blazers had brought a bunch of ringers to Vegas. The typical Vegas Summer League Team has two or three players with NBA experience, and there were nine on the Blazers. It’s no wonder they went on to win the Summer League championship. Despite the apparent talent mismatch, the Spurs made a contest of it and lost by just six, 95-89. It would have been a good game to see, but I had to get back home. Headed up the writer’s room where Seth was watching the Tour de France. Some of the other writers showed up and started passing around wild rumors about a possible trade between the Spurs and the Toronto Raptors. That didn’t seem plausible, so I got ready for my last full day of Summer League games and headed to the arena. One thing that’s great about Summer League is all random kindness from fans to fans. It’s easy to strike up a conversation with a stranger and learn about their teams and how they decided to come to Vegas to see the games. But it can get tough, too. A couple of times a game, the hype team throws NBA branded gear to the fans, and it sets off a feeding frenzy. I I accidentally banged heads with another fan going for a koozie. I won the battle, but I felt so bad about it, I handed the koozie to him. Monday was Noche Latina for Summer League, which was weird, because the games start around noon. Nevertheless, it was really festive with mariachis wandering the concourses. They played Latino music in the arenas, which was great, but hearing Despacito about 30 times in one day was probably a little too much. There is a ton of great Latino music, and that one song is a little overplayed. I made up my own nonsense verses to it by the end of the night, which turned out to be pretty fun, since it’s pretty easy to come up with rhymes for Despacito even if you have a limited Spanish vocabulary. The game I really wanted to see was the Phoenix Suns vs. the Orlando Magic. It was a chance to see the two best bigs face off against each other. Deandre Ayton and Mohamed Bamba. I may be crazy, but Ayton reminded me of a very young Timmy Duncan. OK, maybe a poor man’s Duncan, but he has the kind of explosiveness that Tim had before he injured his knee in 2003. He also plays with a grace and economy of movement that is somewhat reminiscent of 21. Bamba, on the other hand, showed some of the same issues that I noticed in his first game, but he already seemed to be improving. Jack Cooley of the Suns is going to be a player to watch. He’s almost 7 feet tall, but he’s doesn’t have the long arms and slender body of the prototypical NBA player. But he’s strong and big and knows how to use his size to make space. But he’s not just a big stiff, he’s got skills, he can shoot the ball and fights for rebounds. The fans loved him, even chanting MVP when he hit his free throws late as the Suns won easily, 71-53. I saw a few more games, but there wasn’t that much left that was worth talking about. I thought the Lakers looked pretty good, and was really impressed with how Jeff Ayres played for them. But for the most part, it was already over. Most of the teams had seen what they wanted to see from their best players and were just rolling out the bench players, giving a chance for some of the fringe players to get court time. As for myself, I was finally reaching the point of complete saturation, completely bored with basketball. There’s a lot of bad basketball at the Summer League. And that’s not surprising, it’s built that way. I probably saw more shot clock violations in my four days of watching Summer League basketball than an entire season of Spurs hoops. The Spurs were one of the more organized teams at the event, although they weren’t one of the more talented. The teams are all there to develop players and get an early look at their draft choices. Except for the Blazers, who assembled a team of experienced players seeming expressly for the purpose of winning. 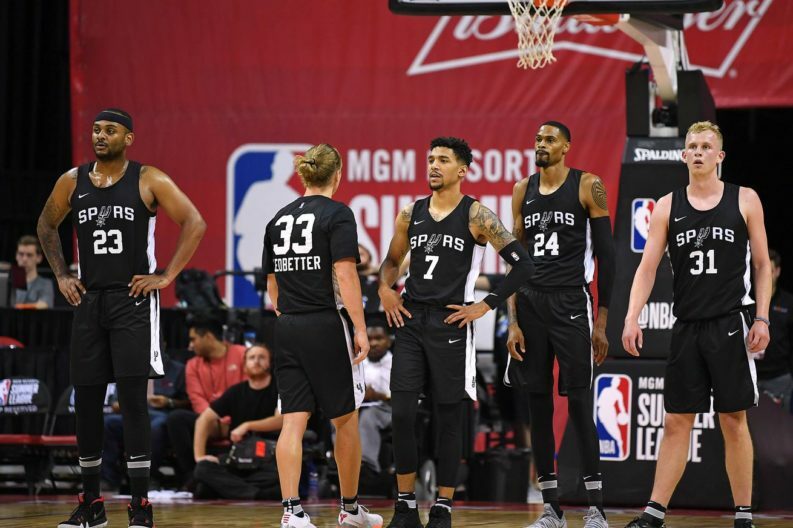 It’s serious business for the players and the coaches, but it’s pretty much impossible to get a sophisticated system installed in the week or so that the teams are together to play Summer League. The Spurs summer squad had some very good players this year, although the overall talent level was probably below average for summer league. Lonnie Walker IV is going to be a really good player if he remains healthy. He has the potential to become a star, but he’s probably a few years away. Derrick White is ready to be a rotation player, and he was the best player on this year’s squad. Blossomgame has developed a lot in the year he’s been of the Spurs and he plays with a lot of grit and intensity, and should at least get a two way contract this year. Chimezie Metu looks like he could develop into a good player, but he’s not there yet. Hopefully the Spurs can keep him under contract while he develops. There’s an old campaign that says “Be Like Mike.” But the truth is that very few of us can be like Mike, because there’s only one guy who can be the best who ever played. But if you can’t be like Mike, maybe you can be like Jeff. I’m thinking about Jeff Ledbetter, the backup point guard on this year’s summer league team. He’s been doing this for a long time, and he works hard at it, and he’s always there for his teammates. I’m also thinking about Jeff Ayres, who was cut from the Spurs but continues to work and improve his game. It’s uncertain whether either one of them will be on an NBA roster this year, but they continue to work at their craft and be good teammates. Persistence is admirable, and if it’s combined with talent and a desire to constantly improve, it will lead to something good more often that not. As I headed to bed, the skies turned dark and flashes of lightning began to streak across the sky. A wave of coolness surged in, and rain began to fall from the sky. First, it was a few scattered drops, and then a steady downpour. For a moment, Sin City was cool and beautiful. Maybe it had been that way all along. It had been an incredible trip, but I was glad to be headed back home. Thanks for reading. Summer League was fun, but I can’t wait until the real season starts. Go Spurs go! The title of this article is a quote from Vivian Greene.